It was a windy afternoon outside and Pickles was lying down in his favorite spot on the window ledge that overlooked the street below. Pickles loved this spot because the sun would warm his fur - and he could see people and cars outside. On a windy day like this he could even see leaves floating around in the sky with the birds. What a busy day it was outside, and Pickles wondered where all the people were going. Was there tuna fish in their bags? Why were there dogs outside pulling people around with leashes? There was so much to wonder about, it made him sleepy, and he yawned. Sometimes Pickles would even see a cat outside running around. He was so jealous, and would meow in the hopes that his Mom and Dad would let him go outside to play with the other cats in the street, but they never did. It was late in the afternoon and Pickles’ Mom came home as she always did. This made him very happy and he would meow and purr and run to greet her. Today she had a big paper bag with her, that she set on the floor. Pickles loved bags and always wanted to crawl inside to explore. Pickles stuck his head in the bag and could see a basket inside. He loved baskets too, because they were great places to hide and sleep. But this basket looked strange and Pickles was curious about it. It had a blanket inside and a top that you could see through. Now what kind of basket was this? Pickles’ Mom took the basket from the bag and set it on the floor. She opened the top and then picked him up and placed him inside the basket. It was comfortable, and he began to purr and walk around in tiny circles. Then she put the top on the basket and tied the straps to secure it. Now Pickles was inside the basket, and he wondered what was happening. His Mom picked up the basket and walked to the front door and opened it. Pickles was so excited and happy! He had never been outside of the house, so he was looking and sniffing in every direction, trying to explore as much as he could. Step-step-step, downstairs they went, and Pickles’ Mom put the basket on the front of her bicycle. 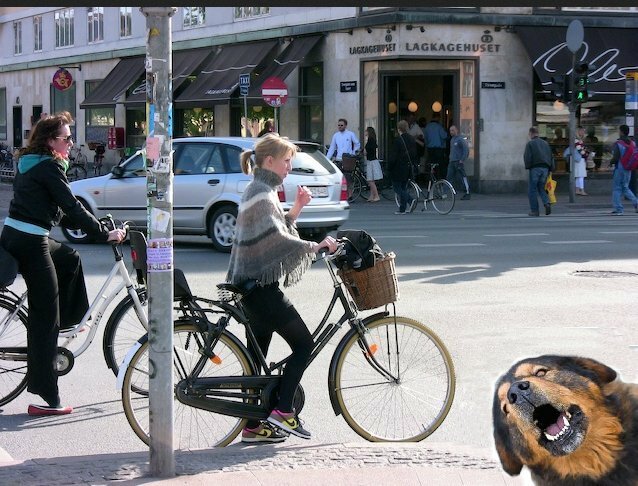 Pickles was very nervous because he had never ridden a bike before - he had only seen people outside do it. He took a deep breath, and the next thing he knew, the bike was moving, and they were riding down the street. Turns out that riding a bike is easy, and Pickles was having so much fun! The wind was blowing through Pickles’ whiskers as he looked around from inside his basket. He could see and smell people and cars and birds and squirrels. He tried to concentrate on riding the bike, but there were so many things around to enjoy. This was very exciting, and now, more than ever, he wanted to be outside all of the time. As they stopped at a traffic light, a nearby car honked its horn and frightened Pickles. It was much louder outside than when he heard it from his spot on the window ledge. Just after that, a dog who was pulling his person around on a leash began barking at Pickles. This made Pickles very nervous, and he meowed. Then they started moving again, and Pickles breathed a sigh of relief. It was scary back there with all of those noises. Everywhere he looked there were so many people and cars and buildings outside - much more than he could see from his window at the house. It’s a big world outside and it’s so busy! 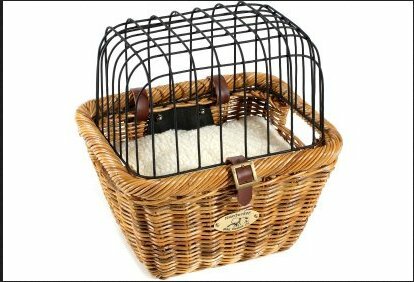 Just then it began to rain, and Pickles was soon cold and wet, inside his basket. Pickles closed his eyes and tried to curl up to stay as warm as he could. It was cold and windy and rainy, and Pickles was scared by all of the people and cars and noises outside. Suddenly the bike stopped and Pickles could feel the basket being picked up. Then he could hear the step-step-step as they went up the stairs. He could hear keys being jiggled and a door opening. When Pickles opened his eyes again they were home! His Mom put the basket on the floor and untied the straps to open the top. Pickles was very happy. He jumped out and began to purr. Pickles was home now, and he ran through the house to make sure everything was in its proper place. Dad was home too, and Pickles meowed and purred with happiness. There was a fire burning in the fireplace and Pickles lay down in front of it to dry off and get warm. He thought to himself that his Mom and Dad must be very brave to go outside every day. Once was enough for Pickles, because it had left him cold and wet and scared. As Pickles drifted off to sleep he thought about his adventure that day. He was no longer jealous about the cats or birds or people that he saw outside his window. He was happy to be inside, where it was warm and dry. He could not wait for tomorrow, so he could once again lie down in his favorite spot on the window ledge that overlooked the street below, and watch the busy world outside. About the Author: Mike Andres has always had a passion for writing. He graduated with a degree in Journalism from Texas A&M University in 1997. Mike is an American living and working in Copenhagen, Denmark with his wife, Brena, and their cat. Sadly his writing is usually limited to corporate emails or business cases, but when he has spare time he still likes to let his imagination and fingers run wild on the keyboard. 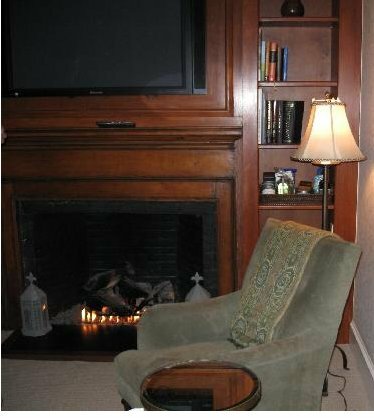 He says that it keeps him young, and he hopes that others will enjoy reading as much as he enjoys writing. This author has more stories online. Check the Author page. You may contact Mike at mikeandres007@hotmail.com. Denmark, where the author lives, is located in Northern Europe, far across the ocean from America. The city of Copenhagen is the capital of the country of Denmark. Denmark is what's known as a sovereign state. A sovereign state is a place with borders where people live, and where a government makes laws and talks to other sovereign states. Like England, Denmark also has a queen. Her name is Queen Margrethe II. 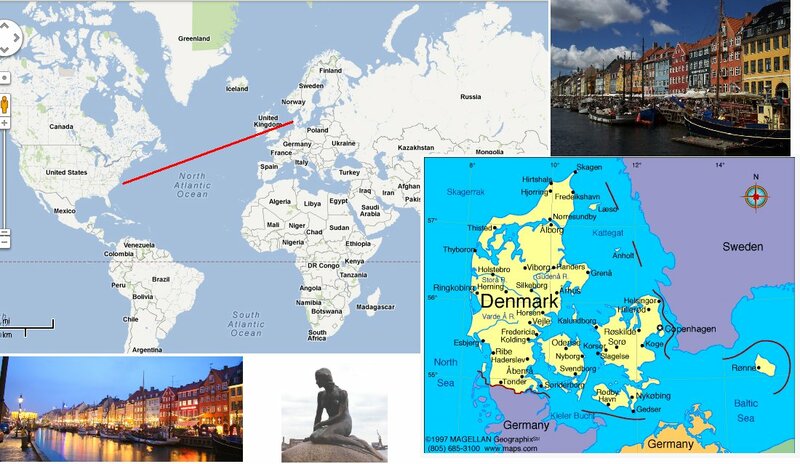 Here is a map showing you where Denmark is located. Denmark was also the home of Hans Christian Andersen, a famous author, fairy tale writer, and poet, who was very well known for his children's stories. The people of Denmark erected a statue of the title character in one of those stories, The Little Mermaid. That story was written way back in 1837. Maybe one day someone will erect a statue in the park of Pickles The Cat. 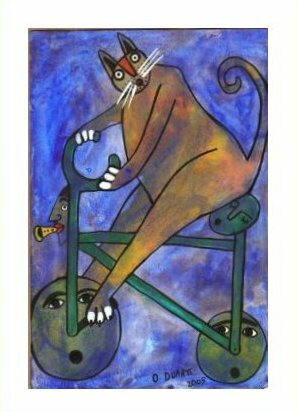 About the Illustrator: Interim images by Bedtime-Story and Cat on Bike by Octavio Duarte, original painting owned by Bedtime-Story. Is Pickles the cat LAYING down or is he LYING down? Mary must lay everything on the table for dinner. Mary laid a fork on the table. Now she's laying a napkin there. Pickles likes to lie on the sofa. He lay down on the sofa for a nap. He's lain there for an hour. He's lying on the sofa now. Susie lies to her mom. She is lying to her mom now. She's lied to her mom many times.